Skeletor’s Ice Attack is a 1984 Masters of the Universe children’s book written by John Grant and illustrated by Robin Davies. Here, the royal family goes on a cruise, only to have Mer-Man encase the ship in ice. This book really should have been called “Mer-Man’s Ice Attack,” since Skeletor only shows up at the end; actually, it should be just “Mer-Man’s Ice,” since for whatever inexplicable reason, Mer-Man never actually gets around to the “attack” part. That’s just part of Grant’s not-trying, something that’s plagued all of Ladybird’s He-Man books. 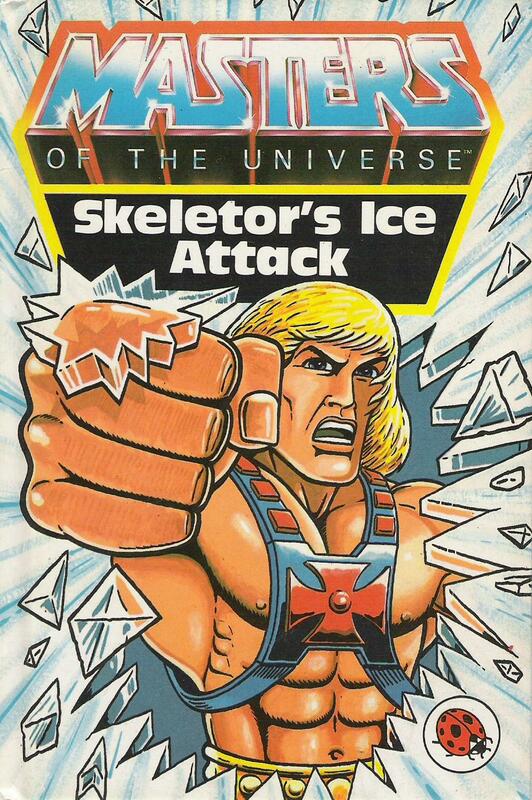 We’re supposed to believe He-Man couldn’t just smash the ice? I mean, jeez, look at the cover. Instead, He-Man decides it would be a good idea to use a volcano to, apparently, boil half the ocean (presumably destroying Eternia’s ecosystem in the process). And the telepathic shenanigans in the name of “the Lord He-Man” are back, too. Unexpectedly, the highlight of the book is Davies’ art, which was quite poor in other books in this series. His figures still aren’t great, but they’re better than they’ve been, and overall, the art is very solid. He also gives us some killer-whale-versus-sea-monster action and an interesting toy/Filmation hybrid of Snake Mountain. Skeletor’s Ice Attack isn’t a good book by any stretch, but it’s as good or better than anything else in the Ladybird series.